I’m really excited to announce a five-year partnership with Dimond Bikes and their parent company Ruster Sports, both founded by USAT 18-24 age-group “classmate” of mine and fellow mechanical engineer, TJ Tollakson. There’s a press release here, where Dimond also announces the exciting news that Jesse Thomas is coming on board for five years as well (another mechanical engineer, though from some cut-rate school in Palo Alto). But, in typical fashion, I wrote about ten times as much as they could actually fit; press releases have a pretty hard word count if you actually want them to get picked up. I’ll be writing more about the bike itself in an upcoming issue of LAVA, but more from a technical approach. So I wanted to take the time now to talk about all the stuff I talked about in drafting up some content for the press release. In the official release, I talk about how the Dimond offers a real competitive advantage in a time when that’s become increasingly rare. To give some context to that, I need to back up to about 2005, when I turned pro. My then-coach (who is also my now-coach), Joel Filliol, insisted that I get a powermeter. At that time, that meant one of two options – SRM or PowerTap. That’s it. It became immediately obvious the benefit that this tool had for training and racing; it was exactly like the rowing machine I had spent so much time on in college. You knew – for better and for worse – exactly how hard you were going. But powermeters were rare. TJ had a powermeter; he was one of the first guys I remember posting power files back then. And the other athletes Joel coached had them. But at races, they were scarce. And I was able to use it to my advantage in a great many races, as well as to make what I think was a relatively rapid ascension as a cyclist in the sport. Likewise, bike fit, which I was introduced to by Paul Levine of Signature Cycles and then which I really learned the ins and outs of working with Dan Empfield and John Cobb, was either unknown or disregarded in terms of import. I’ve done a fair number of bike fits for fellow pros (typically women, who continue to be shortchanged in this regard), because bike fit among pros was – for much of my career – even more of a rarity than among age-groupers. I would say that if Dan Empfield really brought tri bike to the masses, Mat Steinmetz (along with Todd Carver) was the guy who – with Craig Alexander – really brought it from the masses to the pros via Retül. Bike fit among pros was certainly rarer than it was among age-groupers in North America. The Aussies (sorry guys) continue to be laggards here, but as more and more of them spend time in Boulder, it seems that Mat continues to get his hooks into them. And well, you just can’t expect guys to give up the sort of aerodynamic advantage they used to when they were riding slack and sitting up begging the wind to punch them in the chest. And, beyond things that require active decision making – like using a powermeter or getting a bike fit – equipment has gotten much, much better. There are plenty of options now for fast aero helmets, well engineered bikes, slippery aerobars, low Crr tires, and fast wheels. Heck, even clinchers are now at least normal – and becoming “the norm” – as people grasp that they really are just faster and better. It’s just easier now to make a good decision. You used to have to hunt and think – and there is still, with stuff like helmets, some individuality. Or there were big tradeoffs, like tires that were fast but which were paper thin; the tradeoffs are still there, but they are smaller – and getting smaller. It’s a testament to the caliber of engineer employed in our industry that we continue to make the gains that we do. You can go a whole lot faster now on less watts than you could a decade ago. Unfortunately for me, I used to benefit from the discrepancy between my choices on these subjects and that of my competition. This was because of both luck (like getting connected with Dan and Joel) and some smarts (and reading the wisdom of Tom Anhalt, Gerard Vroomen, Paulo Sousa, and other enginerds on Slowtwitch plus the writings of Damon Rinard, Chet Kyle, Mike Burrows, and others); I was able to see that this stuff really did make a difference. But I’m no longer the rare bike nerd now. I’m part of a legion of pros that knows – and cares about – terms like Crr and CdA. Furthermore, at the top level, everyone has gotten faster and stronger on the bike. And more and more people every year are making better and better decisions about equipment. A lot of this is because of the nature of the race – hang in on the bike as long as possible and pray on the run is now a viable, and certainly the most common, race strategy on the men’s side; it’s just harder to win a race if you don’t ride well. It’s a combination of fitter athletes, but also the psychological and physiological/aerodynamic benefit of riding in a group even in a “non-drafting” race. But the reality is that it’s hard to find an advantage on the bike. There are a couple still out there, but the rate of adoption is much quicker. For example, sleeved skinsuits went from being an outlier to being the norm (all three men on the podium in Kona wore sleeved suits on the bike; Jan Frodeno changed for the run, but Ben Hoffman and Sebastian Kienle did not) in less than two years (2012 being the first real year where they showed up, with Marino Vanhoenaker destroying the field in Kona on the bike in his). Everyone is looking for an advantage other than just train harder/more on the bike, since everyone is training more and harder on the bike than ever before. But I think Dimond is really a diamond in the rough (sorry…) here. I think it offers me a real advantage over my competitors. This is for three reasons. The first is the obvious one – the beam design. There are a lot of challenges to beam design – it’s missing the structural support of a seattube and seatstays – and some potential drawbacks (it’s more sensitive to rear wheel and tire choice, though, thankfully this is less of an issue than it was as wheels and tires have gotten more aerodynamic), but done right, you have less things to disturb the wind. There are nuances here that I’ll talk more about in LAVA, but based off the old Zipp data (the 2001 and 3001 were the inspiration for the Dimond) and Dimond’s own data, their bike is fast. Really fast. And that’s great. BUT, what’s clear is that advantages like that don’t last. Certainly not five years. But the beam design has something else going for it – it’s very modular. You have three basic components – lower frame, beam, and fork; you can also include the seatpost here, but I’ll include that with the beam. At some point, you might have an integrated front end, but I’ll group that in with the fork. It’s really the split main-frame that is of interest. Those two pieces are separate, and assuming a consistent interfacing system, you can replace either of those without disturbing the other. 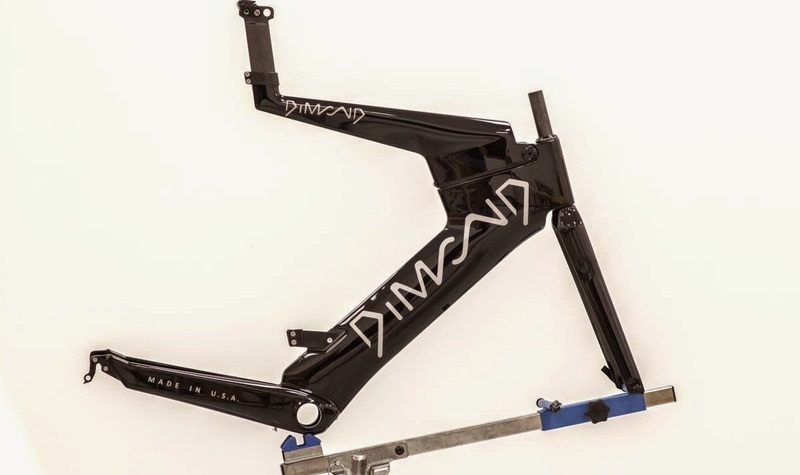 What this means is that you can iterate the bike much more quickly than you can with a double-diamond frame, where you can upgrade “part” of the frame. It’s all or nothing. What that means is that the lifespan of the frame is necessarily much longer. If the lifespan of a mold is 3-5 years, with a beam bike, that means you can see upgrades every 2ish years. That’s important. Especially for a small company, where cutting new molds is a big cost. It’s easier to grow and improve when you don’t need to upgrade the whole frame. But it also gives you flexibility to make one part of the bike better without worrying about needing to do the whole package. Lastly, the Dimond has a dedicated US-based production facility. Part of this is “feel good.” I like stuff that is made in the USA. But just like the modularity, having your own factory in the US allows for much more rapid development. Zipp, unsurprisingly, comes to mind as really the prototype for this sort of engineering work flow. They’ve upgraded the hubs on different timelines from their rims. And they do it all in Indianapolis. And I think it’s why Zipp has been – and continues to be – the leader in carbon wheel development. David Morse, the head of engineering at Dimond, came from Zipp. He’s a great young engineer with a lot of smarts, but – critically – he has seen how an engineering-first company operates. Of course, this bright future is predicated upon sales. Dimond is a small company taking on a big challenge – high-end domestic manufacturing and engineering. And that’s a huge challenge. TJ has always been a risk taker in that regard (I generally group engineers into two groups – innovators and what I call, coming from my coding experience, debuggers. I consider TJ an innovator; he likes to create stuff. I consider myself a debugger; I like to tell you why something will break – or has broken; Henry Petroski is the patron saint of debugging engineers.). And good for him. I’m thrilled to support a good friend, which he has become over the years that we’ve raced against each other, in this endeavour. But it’s a challenge. Ultimately, the future success of this company hinges on convincing folks that the wager that I (and Jesse and David and TJ) have made is right. Some of that will come through success on the race course. But a lot of it will come from telling the story of this company and of this bike. So, that’s my spiel about why I’m riding a Dimond. Guess it was a little long for a press release. I’m looking forward to working with David and TJ on a nitty gritty technical piece for LAVA that will tackle some of the topics I mentioned above in more detail. For now, I’m happy to have the advantage on the race course. But in five years, I’ll be happiest if I’ve helped succeed in transforming a company and – I think – an industry. ← On Racing Well. On 2014, The Year That Was. The bike has good wind tunnel data (but what doesn't have good wind tunnel data in the biking world) but the main differentiator of this bike is the frame. Some data on the frame and how that could help your times would be huge!